Every year, SSON’s survey highlights significant progression in Shared Services models. The past couple of years have shown a clear trend away from transactional, human-based work towards knowledge-driven activity enabled by data and automation. Yet, and despite the anxiety unleashed by “automation”, this has not translated to obvious job losses. Instead, Shared Services Organizations (SSOs) are developing new competencies and taking on growth without adding headcount, frequently by leveraging new Centers of Expertise (as confirmed by 65% of North American respondents) and expanding into new services and geographies. The consistent, aggressive commitment to productivity improvement (2/3 of North American respondents target >5% improvements) are keeping Shared Services leaders focused on innovative solutions that improve effectiveness, efficiency and performance. Today, that is predominantly achieved by leveraging automation and data analytics. According to SSON’s 2019 survey, a third of North American Shared Services are more than seven years old. The trend toward Shared Services is only growing, however, as we see from the nearly one out of three respondents that are at an early stage of implementation — and with a significant segment still at the planning stage. This continues the trend we saw last year, but with slightly greater numbers of enterprises at the planning stage today (19% in 2019 vs. 14% in 2018). Momentum is still growing, in other words. The services in scope still fall largely into the HR and F&A realm, with Procurement also strong. Sales and Marketing is still on the lower end (15%) but Data Analytics is clearly pushing forward — all similar to what we saw a year ago. However, a strong trend emerging this year is that of Centers of Expertise or Excellence (COEs) becoming a fixture. Last year, a number of respondents cited new services being added in the areas of Change Management, Data Services, Automation, and Process Improvement. This year, we see these types of services being solidified in Centers of Expertise. Roughly 2/3 of North American SSOs are now levering a COE. (In last year’s survey, 40% reported they were setting up or expanding in this area). A significant move forwards, in other words. This emphasis on COEs marks a critical watershed. It recognizes Shared Services’ future value proposition in terms of the added value delivered beyond process excellence. In other words, no longer is Shared Services mainly about transactional excellence and improvement. What defines the modern SSO are the insights it shares with the business based on a thorough understanding of services delivered, optimizing delivery via automation, and expanding its scope into analytics. This report highlights Ten Trends emerging from this year’s survey, which emphasize the new direction, strategies and value-add SSOs are carving out for themselves. · Continuous Improvement and Process Design strongly represented in these centers. #2 Fewer & Larger? Or Smaller & More? The defining trend going forward seems to be “fewer but larger.” This contrasts with a localized or more tailored service approach that a quarter of North American SSOs claim. There are two different options going forward: standardized and bigger, but fewer; or smaller, localized, and more. The choice will depend of business needs and overall service objectives: Cost factors tend to drive standardization; customer-centricity a more tailored service. Some of this shift is being driven by automation — 20% of respondents confirm reduced staffing in centers as automation becomes more prevalent — but half say there is no change foreseen at present. Understandable, given the early stage of automation implementation which most organizations find themselves at. Exactly how the impact of robotic automation and other IA solutions will play out on resource allocation decisions remains to be seen. 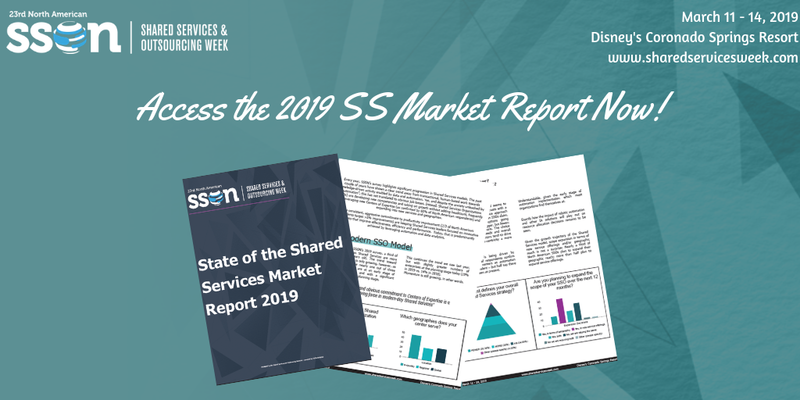 Given the growth trajectory of the Shared Services model, scope expansion in terms of new service offerings and/or geographic reach is not a surprise: Nearly a third of North American SSOs plan to expand their geographic reach; more than half plan to expand service offerings. The benefits of Shared Services are no longer measured primarily in terms of cost and time. Instead, it’s primarily in terms of Control, Customer Service and Agility. Customer Service is becoming more important: Last year 33% of respondents listed it as a key benefit; this year 45% do. A significant segment also recognize the ability to leverage new competencies like Data Analytics and Process Automation as a result of a Shared Services model. These benefits are driven by fairly aggressive improvement targets. A third of North American centers are chasing 7–10% productivity improvement, with nearly 20% targeting improvements above 10%. The value-add many SSOs are chasing today is based not just on doing work but at the same time better understanding it. Data analytics and business insights are a growing opportunity to offer more consultative and advisory support. Promising knowledge services is not just a public relations exercise. This year’s survey clearly demonstrates what we recognized a year ago: Shared Services activity is moving firmly away from transactional work and towards insight-driven knowledge-based offerings. A comparison of this year’s results to last year’s highlights this shift, whereby there are obvious challenges in terms of defining services and transitioning to knowledge work. Outsourcing has been somewhat neglected over the past years as the excitement around automation and its potential for taking over process work that was traditionally outsourced distracted the market. Nevertheless, outsourcing still plays an important role in service delivery as the survey notes. Expectations are shifting however. Today’s customers assume transactional performance as given. What they are looking for, and are increasingly impatient about, is more support in terms of Problem Solving, Data Analytics, and Technology Leadership. The value of a BPO partner — today as it was 10 or even 20 years ago — is about tapping into resources that are either not readily available in-house or that are already allocated to other departments. As BPO providers have honed their service performance, customers now expect them to leverage the process expertise acquired to deliver enhanced services. Many of these services, customers believe, should be based on state-of-the-art automation and cognitive solutions that customers’ budgets don’t stretch to. The shift is reflected in the relatively low numbers that are still embracing largely FTE-based contracts. There is also increased interest in analytics-based services and output-based metrics, in contracts signed today. Customers’ focus, in other words, is shifting to providers’ ability to leverage new, innovative technology for their benefit. Despite the warnings frequently voiced in headlines about organizations taking work back in-house as a result of process automation, the survey does not confirm this to be a significant trend. Whether this will change remains to be seen. Certainly, outsource providers should heed the message and focus on a partnering role in which the customer’s objectives determine service strategy. Shared Services’ modus operandi is based on optimizing “back-office” work by professionalizing it. What that means, in effect, is that work traditionally just done, is now done by experts. What was administrative activity becomes the sole purpose of the Shared Services Center, with productivity constantly evaluated. Performance improvements don’t just happen, however. Shared Services have always been open to partnering with third-party consultants and advisors to help identify gaps and opportunities. This need still exists. The survey confirms that Shared Services leaders look for external support and expertise in driving change management, assessing performance and effectiveness, and evaluating existing delivery models, primarily. Today’s environment and the increased adoption of technology and automation only serve to highlight challenges around “change.” Transformation continues to succeed or fail on the basis of effective planning and change management. As new tools present themselves and the nature and mode of work shifts, we can expect to see demand for advisory services continuing. It’s been four years since robotic process automation was introduced as a promising solution in service delivery operations. Intelligent Automation, as we have since come to think of it, continues to make strong advances and is rapidly expanding in enterprises that have adopted it. However, a significant segment of the market has yet to get started. One year ago, nearly 60% of enterprises surveyed were at the testing or planning stage. Just under 40% had not yet committed. A year later we see the number of enterprises not yet committed to automation dropping to 30%. Almost a third of enterprises confirm they have now implemented automation, rising from single digits just a year ago. The survey indicates that, on balance, automation is still seen primarily as a task specific tool. Those organizations that have a broader grasp of its capabilities and are willing to embrace the change that goes with it are fewer, but momentum is building. Providers across the board are positioning themselves to meet this demand. Most implementations to date still fall in the “five bots and under” category, with a few selective leaders who have committed more comprehensively to robotic processing. There are plenty of challenges to making automation work. Where projects have failed, the survey tells us this is predominantly due to wrong process selection and lack of stakeholder engagement. It’s a message being posited again and again. Careful planning, process evaluation and selection for automation is crucial to success. This points to the advantages of assembling an experienced team from the start and incorporating third-party expertise where in-house expertise is not readily available. Scaling drives successes or wins derived from automation exponentially. But there are numerous hurdles or stall points that need to be if not overcome completely, then at least planned for, to avoid the project being derailed. The extent to which automation can be scaled up depends, among other things, on who owns the strategy. Our survey shows this clearly to sit with Shared Services, which allows the greatest scope for leveraging across the enterprise via standardized processes. Interestingly enough, and somewhat in contrast to pervading best practice, more than a quarter of respondents indicate that ownership of the automation strategy sits with IT. The modern workforce is significantly different from the one most of us grew up with. “Digital assistants” (a.k.a. robotic software) will take on much of what was traditionally manual and transactional work, and therefore often outsourced. The work that remains will increasingly revolve around a better understanding of business objectives and will leverage data analytics. This presents significant challenges to HR leaders, predominantly in identifying, recruiting and fostering the innovative mindset and leadership skills required to move forward. The top skills gaps SSO leaders highlight are innovation, process excellence, data analytics and automation — just as they were a year ago. One of the challenges is to support management in transitioning to a hybrid workforce. In other words, reassuring those used to overseeing human teams that they have the skills required to oversee a combination of humans and robots. This is causing a lot of anxiety, which organizations are countering predominantly through change management and training. Development of operations management consoles that allow visibility to work output will go some way towards eliminating these concerns. However, the survey highlights that most organizations have not yet addressed this issue. Today, although feedback indicates significant performance gains realized through automation — particularly in quality, productivity, and fewer errors — there are still obvious gaps that need to be addressed. Lack of change management is certainly hindering automation effectiveness. One area that may increasingly come under the spotlight as Shared Services ramp up the scope of automation: “incomplete ecosystems” are impeding the ability to scale. This refers to the integrated network of enabling factors spanning data cleanliness and accessibility; skilled resources; adequate skills training; stakeholder support; and internal partnerships. #10 Tomorrow’s Brave New World: How Ready Are You? This year, those who plan to invest in new automation solutions are fixated predominantly on Machine Learning and Artificial Intelligence. It may be a case of enthusiasm and perceived significance getting the better of the market, however. Very few of the survey’s respondents are currently in a position to leverage these new tools: When asked whether current resources would allow them to leverage new automation solutions, the majority of respondents confirmed they did not, whereby the gap between “yes” and “no” was smallest in Machine Learning, and largest in Blockchain. Similarly, many of the new automation solutions depend on data, and lots of it, to “feed the automation beast.” Most respondents are not currently in a position to tap into the data required. More significantly, there is still a lot of work to be done in educating the market. Roughly half the practitioners confess to not having a clear understanding of the potential of new and emerging automation solutions. Machine Learning and AI tended to rank higher in terms of customers’ understanding of their potential. Whether this is based on fact or fiction remains to be seen. While Shared Services have worked hard over the past two decades to gain improved respect for their output and productivity, not since the early days of outsourcing has there been such an opportunity to leverage a competitive advantage. The trend towards automation adoption continues, as does the appetite for brand new emerging AI- and Cognitive-driven solutions. Twenty years ago, the talk was of “lights out” processing. Not much happened in the intervening time period. Now, suddenly, that promise seems within reach after all. But processing and technology only represent two of Shared Services’ three prongs — the other being people. For many, people remain the most influential factor. In fact, we are already hearing voices suggesting that humans need to be re-integrated into automated processes (and that, despite automation only just having taken off). Cracking the talent dilemma will remain on top of Shared Services leaders’ lists. More specifically, the challenge right now lies in identifying what kind of work humans will be redeployed to, how to prepare them for this work, and how to manage the transition.